Here’s another post in the continuing saga of globalpharma dot biz. It was originally published as the TKPOTD for 15 September, 2013. Team Kimberlin seems to be simplifying its footprint on its Dutch server. The table on the left shows the sites that are still up and the one that was added over the summer. globalpharma dot biz is a site for a company that seems to have its physical presence in Arizona. It offers various prescription drugs for sale over the Internet without requiring a prescription. All are schedule IV drugs commonly used for recreational purposes. The site was originally owned by an LLC registered in Delaware. The identity of the registrant is now protected. The current status of the Delaware entity is shown below. 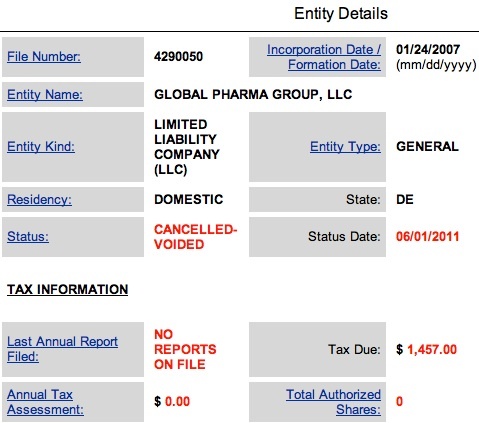 So whoever ran Global Pharma Group, LLC, was a deadbeat when it came to paying his taxes.